It might seem like only a few weeks ago that we were all packing up our Christmas decorations, but we’re now almost a quarter of the way through 2018. Supermarket shelves have already begun to fill up with enormous chocolate eggs, and that can mean only one thing: Easter is just around the corner! With any luck, the weather will have taken a turn for the better, and the break from school will provide an opportunity for the whole family to spend some quality time together. The question is, how best to spend your time, especially if you’re on a bit of a budget! If we’re really honest with ourselves, most of us will spend the Easter break cramming more chocolate into our mouths than our doctors would advise. So, what better way to burn off those extra calories than with a brisk walk through the countryside? It’s a great way to tire yourself out before lunch on Easter Sunday, and to ensure that the kids don’t spend the weekend sprinting around the house in a sugar-fuelled craze! It’s definitely worth investing in a quality pair of walking boots for yourself and the kids (or, if you’re not tackling particularly tough terrain, a pair of wellies!) – after all, a long walk is something that should be done more than once a year. With the help of the right footwear, aching feet won’t be a problem when you return from your adventures! Of course, it might be that you and your children have a bit of a creative side. Easter crafts or activities offer a great way to explore this, especially if the weather’s not so good! There are plenty of Easter crafts you can make at home, the most obvious of which is egg-painting. The kids will undoubtedly take great delight in splattering colours across the eggs – just be sure that they’re hard-boiled before you get started if you’d like to prevent any sticky accidents! When you’re done, you can head straight for the garden for an egg-and-spoon race. But of course, egg-painting is just one of several Easter crafts you might try. Papercrafts, necklace-building and making rabbit-themed costumes and masks will all provide a means of killing a few hours on a cold or wet Easter afternoon. Materials are inexpensive and can be purchased at any decent craft shop – but stock up before you get started; you don’t want to run out mid-crafting session! If you’re looking for things to make and do at Easter, and you’d also like some delicious grub to serve up, then why not fire up the oven and get everyone involved in some baking? Traditionally, you might serve up a platter of hot-cross buns on Good Friday – and so it’s a great opportunity to teach the kids (and possibly yourself) the finer points of bakery! If you’re feeling especially generous, you might even allow them to lick the mixing bowl clean once you’re finished (definitely the best bit!). If hot-cross buns aren’t your thing, there are of course many different recipes you might try out, including miniature rice-crispy cakes (grab a few mini chocolate eggs and make them into Easter nests), and other snacks that make egg-cellent (sorry!) Easter treats. Keep in mind basic safety, especially if you haven’t cooked with the kids before – don’t allow them to handle knives, or work over hot stoves. But cake mixture can be stirred by even really little ones, which makes it a perfect entry-point into the wonderful world of cookery, and a great way to spend the Easter bank holiday! The Easter break is a perfect opportunity to take the kids to see a film during the daytime. Many cinema chains offer discounted rates on certain days of the week, and family tickets that’ll allow everyone in for a fixed price. If there’s a specific film they’d like to see, then it’s sure to be rip-roaring Easter bank-holiday fun. On the other hand, you might prefer to stay indoors and watch a film. This is, of course, the cheaper option. There are always plenty of great kids’ films shown on TV over the Easter break, and if you’ve access to a streaming service or film collection of your own, your film might well pick itself. Get your slippers on, grab some popcorn and snuggle up under a duvet for a perfect rainy family afternoon! You might wish to invite a few friends over in order to celebrate Easter in style. It might be tempting to plonk the kids down in front of a games console for the duration, but you can have some real Easter bank holiday fun with some simple games. Most of the traditional games are, of course, egg-themed, and based around guessing how many eggs are in a jar, juggling eggs, tossing eggs, catching eggs, hiding eggs and finding them (which we’ll touch upon shortly), and egg-and-spoon races. Everything, pretty much, except actually eating them! If you’d prefer to take a small break from everything egg-related, then party classics like pin-the-tail-on-the-donkey, Twister and musical statues will surely please – and if you’re imaginative you might even put a bit of an Easter twist on each game. Plus, it’s a really good excuse to eat all those yummy Easter treats you’ve baked! The Easter weekend provides a fantastic opportunity to get away from it all, if you’ve got a little bit of spare money to spend. Whether it’s a city break in Europe, a bed & breakfast in the Peak District, or a rented cottage near a Cornish beach, a trip away from home will provide a refreshing change of scenery, and one of the most interesting things to do over Easter bank holiday. Of course, long drives can be stressful, particularly if there are children in the car. You can help make sure the kids are as comfortable as can be during the trip with the help of a little preparation. Try to time everything so that they’re tired and able to sleep in the car, and that they go to the toilet before you set off. You’ll also want a few suitable games to pass the time. If the thought of packing stresses you out, take a look at our guide to packing for a weekend away for some top tips! Heading out into the open air is one of the best things to do during Easter. We’ve already covered walking – but that’s just the beginning. 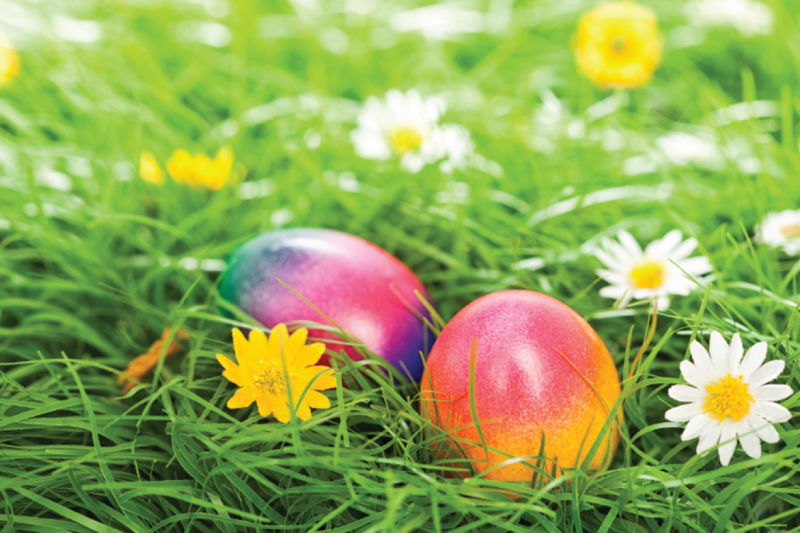 Many local parks will probably provide an Easter egg hunt for children of all ages. If your children are different ages, you could even organise your own, and tailor it for older children as well as younger ones. Arrange some prizes and you’ve got a fun day out that everyone will enjoy! If you’re prepared to venture a little further afield, a larger national park or botanical gardens will provide a chance to get a bit of sunshine (hopefully! ), along with plenty of green and pleasant things to look at. Adventure playgrounds and treetop adventures like Go Ape! will provide older children and adults with an afternoon’s high-octane fun – provided, that is, that they’re brave enough! Heading out? Kit the little ones our with our kids’ trainers, just the thing for running off all that energy! Uniting children with awe-inspiring animals is a sure way to get them smiling. If you’re fortunate enough to live near a major zoo, safari park, or falconry centre, then so much the better. But you could also pay a visit to a smaller farm or petting zoo, where you’ll be able to get up-close-and-personal with all manner of farmyard creatures, great and small. Sure, you’ll spend a little bit on entry, and a little bit more on animal-feed. But in exchange you’ll get memories that’ll last a lifetime, and an excuse to stomp through muddy fields and meet some llamas! Farms that are open to the public usually come with a small shop (or even a large one) where you’ll be able to pick up some yummy treats to enjoy, or even some ingredients for your Easter Sunday lunch. If you’re tramping through muddy fields, wellies are key! Shop our kids’ wellies range here. If you’re the sort of family that likes a bit of history, then a trip to the museum is a must. Since many museums are free to enter (many ask for a voluntary donation), this is an activity that won’t break the bank. You’ll be able to expose your kids to interesting topics, and get them walking in the process! Whether they’re interested in dinosaurs, history, geography or art, you’ll be able to find a museum to match. Again, this one’s perfect if the weather’s not so good, but make sure you all wear comfy shoes, especially if you’re hitting one of the bigger museums – there’s a lot of walking involved! We’ve touched upon just a few of the ways you might spend the Easter break with your kids – but there are many other things you could do! Whatever you and your family decide to do, we hope that you have a thoroughly enjoyable time doing it! How To: Style Your Laces!